Identification: The water chestnut is an annual aquatic plant whose leaves occur both above and below water. The leaves that float above water are triangular and have saw-like, toothed edges. They are shiny on the topside and dull with fine hairs on the underside. The petioles on the surface leaves have large bulbous sections called air bladders. The leaves form a rosette on the surface and can be up to a foot in diameter. 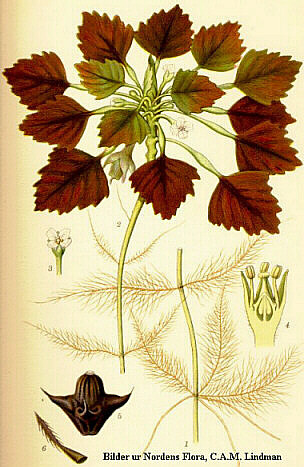 The submersed leaves are divided into segments that are whorled around the stem and are feather-like. Amongst the surface leaves are small white flowers that extend from the axils. The fruit is a large (2.5 cm), woody, nut that has usually four, but sometimes two sharp, barbed points and contains a single fleshy seed. Each rosette can produce as many as 10-15 of these seeds. The plant stems are long and cord-like and can grow up to 16 feet in order for the plant to become rooted. Original Distribution: The water chestnut is a native of the warm temperate regions of Europe and Asia and tropical Africa. In Africa it is native to countries such as Algeria, Tunisia, Sudan, Tanzania, Uganda, Guinea-Bissau, Angola, Malawi, Mozambique, Zambia, Zimbabwe, Botswana, Namibia, and South Africa. In Asia Trapa natans is native to Turkey, Georgia, China, Japan, India, Pakistan, and Vietnam. Finally, the countries where it can be found in Europe include Austria, Czechoslovakia, Germany, Hungary, Poland, Switzerland, Belarus, Ukraine, Albania, Bulgaria, Greece, Italy, Romania, Yugoslavia, France, and Spain. Current Distribution: Currently the water chestnut can be found in New York, Delaware, Maryland, Massachusetts, New Hampshire, Pennsylvania, Vermont, Virginia, and Washington D.C. It is also found in the Great Lakes Basin and Quebec, Canada. It can also be found as a nonnative in Europe, the Caucusus (Chechnya), and Siberia. Water chestnut was once found in localities in Holland, Belgium, and Sweden but has since vanished. Site and Date of Introduction: The introduction of water chestnut is believed to have happened in 1859 at the Cambridge Botanical Garden in Cambridge, Massachusetts, however there are conflicting reports. More generally it is accepted that it entered the U.S. somewhere in the northeast in the 1850s. The first observed case of water chestnut in New York was in 1884, in Sanders Lake, in Schenectady. From there it was able to spread, through interconnected waterways, to Massachusetts and Vermont. It was first reported in the southern part of Vermont’s Lake Champlain in the 1940’s. Eventually, water chestnut made its way into Canada and was found in South River, in Quebec in 1998. Mode(s) of Introduction: The water chestnut was intentionally introduced into several ponds at the Cambridge Botanical Garden in Cambridge, Massachusetts by a gardener. It was also planted, again intentionally, in a pond in Concord, Massachusetts next to the Sudbury River. The plants aesthetic appeal was the reason for this intentional introduction. It was then introduced into other areas via interconnected waterways. The seeds were able to disperse into distant rivers and lakes by animals who unknowingly carried them while foraging, including Canada Geese. They can also become attached to mammal fur, human clothing, nets, wooden boats, construction equipment, and other vehicles aiding in their dispersal. Reason(s) Why it has Become Established: Although it is difficult to pinpoint characteristics that make a species successful at becoming established there is one that can be agreed upon by all. The repeated introduction of a species into an area increases the likelihood that the species will become established. When water chestnut was first introduced into the U.S. it was as an ornamental. Humans were trying to help it become established for a specific reason. Any species that is cultivated by humans, whether it is agricultural or ornamental, will have a greater chance of becoming established solely because we want it to happen. In addition there are no native predators here in the U.S. to control the population growth. The native waterfowl find water chestnut to have no nutritional value and therefore do not feed on it letting it grow unabated. One seed can produce 10-15 rosettes with each rosette producing 15-20 seeds. These seeds then have the ability to remain viable for up to 12 years because of their protective coating. The combination of a large number of seeds and their extreme hardiness helps the water chestnut to become established. The rosettes can also break off from the plant and survive on their own. They then float with the current and get dispersed long distances. This adds to the number of dispersal methods for the plant again increasing its chances to establish itself. Ecological Role: In its native habitat water chestnut is cultivated and eaten by native people. However, in its new habitat water chestnut plays a totally different role. First, it directly competes with native submerged aquatic vegetation for resources by growing in dense patches and crowding out these native species. These dense patches are also a hindrance to navigation in the waterways. The plant itself has very little nutritional value and cannot be eaten by native waterfowl. Because of this lack of nutritional value it has no native predators. In its native habitat there are predators that are closely associated with the water chestnut. The leaf beetle, G. birmanica, defoliates most of the plants, causing the mats of plants to sink. Chironomid midges are also frequently associated with the plants, but for the most part are only filter feeders, not herbivores. By cleaning the leaf they may allow increased light absorption and gas exchange, helping the plant to grow. The Italian weevil, Bagous rufimanus, feeds within the fruit stems and might be more damaging at higher than observed population levels. However, these species are not found in their new habitat. There are some species that do associate with water chestnut here in its new habitat. Among these species are duckweeds and filamentous algae that grow among the rosettes. Here they can take advantage of the shelter provided from the wind and currents. Because of its decomposition and the large quantity of detritus that is produced water chestnut plays a role in altering the oxygen levels in the water. This will then have negative impacts on fish populations and other plants in the area. Benefit(s): Because of their high densities, water chestnut may play a role in water purification. The high density of these plants slows down water currents allowing for deposition of sediment and removal of nutrients. A study by Tsuchiya and Iwakuma (1993) has shown that water chestnut removes nitrogen from runoff, preventing the eutrophication of water downstream. They have also shown the ability to accumulate heavy metals. Since most animals do not eat the water chestnut, it would effectively remove the heavy metals from the water where they could be potentially hazardous to other plants and fish. Not only can the plants improve water quality, but they also provide some utility for wildlife. Water chestnut can provide a habitat for invertebrates. These invertebrates then become a major food source for fish. Birds can also use the water chestnut beds to forage on. They can walk out on the beds and eat the insects associated with the plant. Norway rats, eastern chipmunks, and gray and red squirrels also eat the nuts. In its native India the water chestnut is valued for its nutritional and medicinal values, used to treat illnesses from rabies to diarrhea. There are also other possible ways to exploit water chestnut including for paper pulp, fertilizer, fish food, compost, and biogas fuel. Threat(s): The ability of water chestnut to cover nearly all the water surface at times causes it to block 95% of the sunlight from penetrating the water. This affects the plants underneath by shading them out and not allowing them to grow. By replacing these native plants, there is a subsequent loss of many animal species that depend on these native plants to survive. Eventually there is a loss in local biodiversity making the area susceptible to other invasions and extinctinons due to stochastic events. 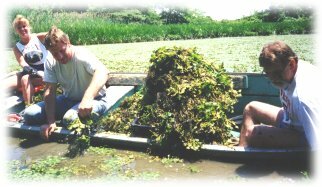 Epiphyton, including algae, cyanobacteria, and macroinvertebrates have been shown to favor the submersed vegetation as opposed to water chestnut which floats on the surface. Since the water chestnut crowds out this submersed vegetation there is a decrease in epiphyton, which is a major food source for epiphytic fauna, which is then a food source for fish and waterfowl. Not only does the crowding affect the populations of other plants, but also the water chestnut alters the dissolved oxygen content of the water, which has an impact on plant growth. The crowding of the plants decreases the dissolved oxygen content making it more difficult for plants to survive. Water chestnut has the ability to survive in these anoxic conditions, however most plants do not. The decrease in dissolved oxygen content and plant and macroinvertabrate levels could also lead to fish kills. 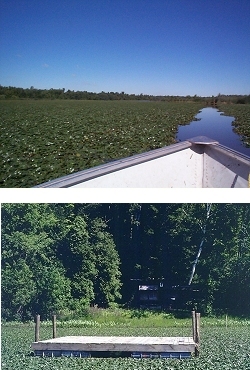 The water chestnut also threatens recreational use of the waterways. Boats get tangled up in the dense mats and damage their engines, while preventing them from navigating the waters. Sport hunting and fishing is also declining in these areas because the populations of waterfowl and fish are declining due to loss of native plant species. Organic waste also builds up in the dense mats leading to water pollution and breeding grounds for mosquitoes. Control Level Diagnosis: “Highest Priority” – Measures to control the water chestnut should be addressed immediately. Plant populations are growing very rapidly and ecosystem destruction is already being seen. The longer we wait the more time and money it will take to control their populations. The time to act is now. Control Method: There are many ways that have been attempted to control water chestnut. The major methods are chemical, physical, and biological control. There are also attempts being made through the use of legislation and education. The use of herbicides in the Mohawk River, the Hudson River, and Lake Champlain have been effective in reducing the population density, however many native plant species are also susceptible to these chemicals. Herbicides, such as 2,4-dicholorophenoxy acetic acid (2,4 D), have been known to also have harmful side effects on fish populations. This control method is seen as less expensive than physical methods, however there are some trade offs with the hazards. There are two types of physical control methods being employed, mechanical and hand harvesting. The plants can either be cut out by machines or pulled out by hand. These methods are best used before the mature fruits begin to drop. It is critical to remove the whole plant so that fragments are not left behind to reproduce. This makes these efforts time consuming and costly. Biological control has also been looked at. In the early 1990s research was being done to find a native predator. The beetle Galerucella birmanica, has been known to eat up to 40% of the leaf tissue, but was also found to have detrimental effects on other plants. Other insects were found to eat the plant but were not damaging enough. Predators that are found in India have potential but would not survive the cooler climate in the northeast U.S. Grass carp is another species with potential, however it does not solely feed on water chestnut and might damage native plant populations. Water chestnut has also been found to be susceptible to pathogenic fungus. One such fungus was cultured from a plant in the Watervliet Resevoir and could be used for control purposes. In addition to the many present and potential methods, the control of water chestnut can be supplemented with legislation and education. Presently 35 states have designated water chestnut as a noxious weed. By doing this they make it illegal to propagate, sell or transport the weed. A combination of these many methods might be the best way to control this problem. dissolved oxygen in a large river. Ecological Applications. 12(5):1496-1509. Demography in Trapa natans (Trapaceae), an annual, clonal, aquatic macrophyte. American Journal of Botany. 83(11): 1406-1415.3. Implications for Management in North America. Journal of Aquatic Plant Management. 42: 17-28.
southern New England: a historical perspective. Biological Invasions 1(2 and 3): 281–300. metabolism and development of seedlings of Trapa natans and two ecologically related species.Physiologia Plantarum. 86(1):168-172.
growth of waterchestnut as influenced by cutting. Journal of Aquatic Plant Management. 31(JAN. SPEC. ED.):154-157. Watershed: A Regional Management Plan. Maryland Department of Natural Resources. 9. Vermont Department of Environmental Conservation. 2004. Water Quality Division. 10. Pemberton, R. 1999. Natural enemies of Trapa spp. in Northeast Asia and Europe. 11. Titus, J. 1994. Submersed plant invasions and declines in New York. Lake & Reservoir Management. 10(1):25-28. 1. Diagram of water chestnut taken from http://www.iisgcp.org/EXOTICSP/waterchestnut.htm Credit: Lindman.